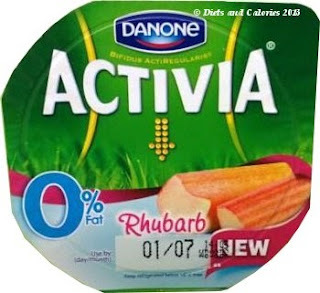 Activia have introduced a new fat free Rhubarb variety to their range of single pot yogurts. Rhubarb isn’t one of my favourite fruits, despite their low calorie count, but for some reason, I love it in yogurt. Shape Delights do a gorgeous Rhubarb Crumble yogurt which I’ve been buying since it was first on sale. Another yogurt always in my fridge is the fat free Raspberry yogurt by Activia which is lovely and creamy with an exquisite taste. With this in mind I was looking forward to sampling the new Activia flavour. The 155g pot is slightly smaller than most of the regular single Activia pots but manages to scrape in at under 100 calories with 97 cals per pot and has 0.2g of fat. What’s not so great is the sugar content. The whole pot contains 16g of sugar or just under 4 teaspoons. To be fair, since rhubarb is such a sharp tasting fruit, it does need a fair amount of sweetness added to make it palatable. This yogurt is sweetened with sugar (3.9%) as well as burnt sugar syrup and sweeteners (Acesulfame K and Sucralose). So how does it taste? Delicious. It’s thick and creamy with just the right amount of sharp/sweet contrast. There’s 9% rhubarb per pot which doesn't sound like a lot, but in fact seems like the right amount to me. The size of pot is good for a dessert on its own. I will buy definitely buy this again based on taste but wish it was in a smaller pot. The Shape Rhubarb has more calories per 100g but because it's in a smaller pot, has fewer calories overall. With these single pots I usually use half and mix it with fresh fruit which makes for a healthier and more filling dessert. Of course, choosing fat free often means more sugar. The regular Activia Rhubarb yogurt has 12.8g of sugar and 3.2g of fat (only just above the green traffic light threshold for fat) and is worth 95 calories per 100g. The fat free version has marginally less sugar with 10.3g per 100g but has 63 calories and 0.1g of fat. Another lower calorie fat free rhubarb yoghurt can be found at Asda who do a large sized pot which provides excellent value for money. This yogurt was purchased in a branch of Tesco. Nutrition Information per pot (155g): 97 calories, 7.1g protein, 16.6g carbohydrates, 16.0g sugars, 0.2g fat, trace saturates, 0.5g salt. 260ml calcium (33% of RDA).